It’s been years since I let my subscription to Journal of Bone and Joint Surgery lapse. I could barely afford it and, as those Shriners soon found out, I am not actually a surgeon. However, I do enjoy pouring a glass of Old Granddad, sitting down in my favorite chair, and reading up on Snapping Scapula Syndrome or the Three-Dimensional Kinematics of the Rheumatoid Wrist After Partial Arthrodesis. It does a body – and a soul – good. Thanks to a new online market, DeepDyve, I’m never further than a click away from those relaxing and enlightening scientific papers. The site, launched today, offers full-text search of scientific articles along with 99 cent downloads and a subscription service that allows fans of Clinical Chemistry to read as many stories as they’d like. Why is this important to me? you ask. What do I look like? A rocket surgeon? Well, there is an untapped market for scientific research. Doctors, for example, may have access to these journals at school but they rarely can afford them in their own private practices. Scientists, amateur or professional, may want to look up something important to their work and the ill and infirm may want to look up their treatment options. Because most journals are kept offline, most readers thus far have resorted to piracy either by asking for a photocopy from a friend or downloading the journals from pirate research sites. Yes, pirate research sites exist. 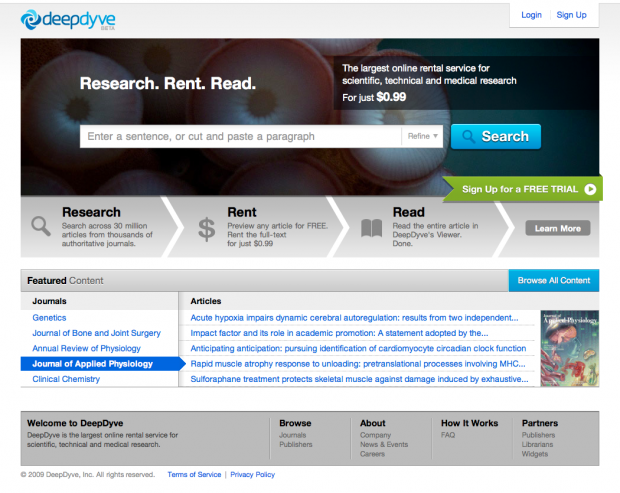 DeepDyve launched last year as a search company. Their specific expertise was in large string searching, allowing you to look for multiple topics in one search string. This led to work in the research space and, ultimately, the company changed into a article rental service. Articles cost 99 cents for 24 hours and an unlimited plan for $19.99 a month. A $9.99 plan allows you to access 20 articles per month for up to seven days each. The site currently holds 30 million articles and each article is indexed and available in a free preview. You can create email and RSS alerts on specific topics and a “More Like This” feature allows you to dig deeper into a topic. The company is based in Menlo Park and received $9 million in angel funding. Are you a big fan of research? 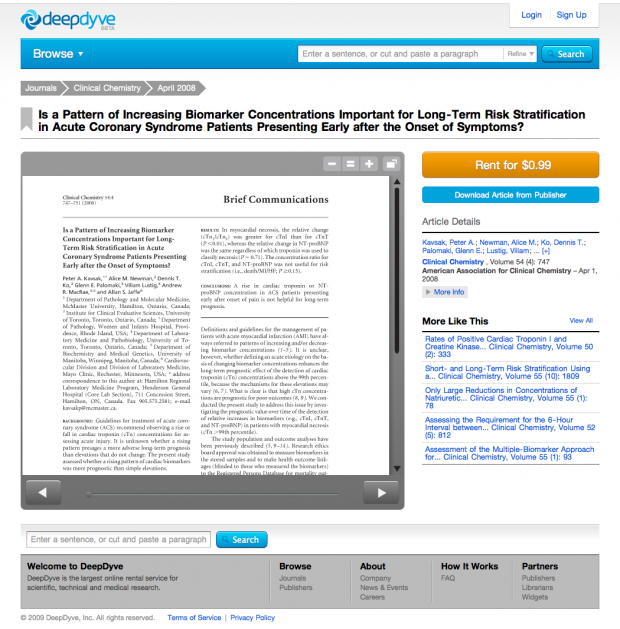 Leave a comment and we’ll be giving away free subscriptions to DeepDyve to 10 random readers. Now back to Spinal Injuries and the Sacral Arch and another snoot of whiskey.